California’s decision to require solar on virtually all new homes starting in 2020 sets a remarkable example for our nation when it comes to reducing fossil fuel emissions that pollute our air and contribute to global warming. Unanimously approved by the California Energy Commission, the decision is expected to have a massive impact on the demand for rooftop solar in the Golden State — already a leader when it comes to the amount of PV (photovoltaic) solar installed, with 5.2 million solar homes, according to the Solar Energy Industries Association. The decision, an update to Title 24, the state’s building energy efficiency standards, is clear proof that solar makes financial sense. By lowering — or sometimes eliminating — electricity expenses, solar reduces the cost of home ownership, whether you’re buying a newly constructed residence or retrofitting an existing home. Energy efficient homes are not just a trend being driven by lawmakers: At least a third of single family and multifamily builders said in a survey that green building represents more than 60 percent of their portfolio, according to an article by the National Association of Home Builders, and customer demand is among the key drivers of that trend. SunPower understands the new homes solar market like no other solar company. We pioneered the solar movement with homebuilders and secured strong contractual agreements with most of the nation’s largest home builders. Since launching our builder-focused channel in 2006 we’ve installed solar systems on more than 30,000 new homes in more than 1,000 communities. Currently, our participating builders are adding solar to entire communities, which drives efficiency, quality and systems integration. The resulting benefit to the customer is that we provide lower cost electricity when compared to how one traditionally thinks about buying energy. To help our homebuyers make informed decisions, SunPower provides each buyer with a custom energy consultation. Whether you’re choosing to invest in owning your system or purchasing lower cost electricity from SunPower via a lease, our solar consultation is designed to help customers make the best choice for their family and that new house they will call “home” for years to come. 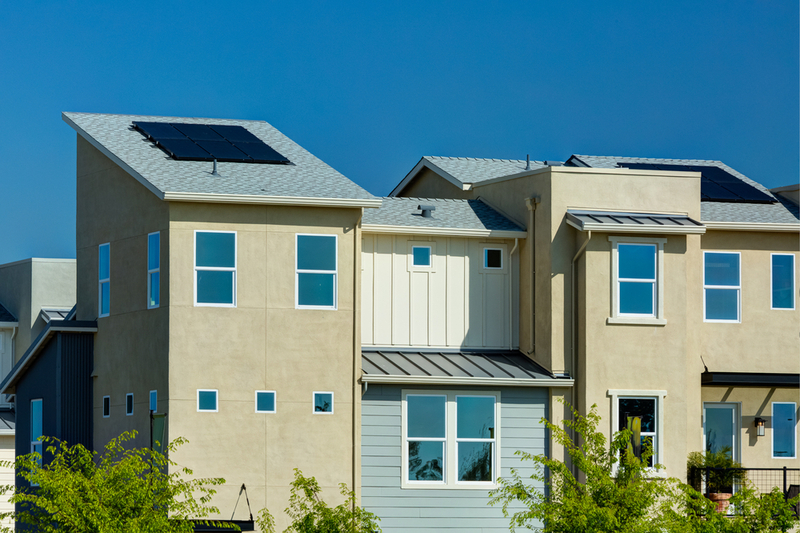 SunPower is putting its flagship product into every new home we’re powering. If you buy a home from a builder that uses SunPower® solar technology, you’ll be getting our popular and attractive Equinox™ solar solution. That means your home will be equipped with the most efficient, durable solar you can buy2,3 — designed to generate 60 percent more energy in the same space over 25-years compared to conventional panels4 and with a best-in-industry 25-year combined product and power warranty. If you’re a builder looking for a solar company to help you meet California’s new homes solar requirement, SunPower offers more than three decades of experience in designing and manufacturing solar and has more than 12 years of experience working with high production homebuilders to design, install and manage the largest fleet of new home systems in the U.S. We’re known for operational excellence on high-volume projects, so there’s no risk of delayed construction schedules or worse, delayed closings. We also understand the importance of keeping costs down while still providing tremendous value to both the builder and the homebuyer. We’re looking forward to the coming home solar boom in California and the rest of the nation. 1 Tax credits subject to change. SunPower does not warrant, guarantee or otherwise advise its partners or customers about specific tax outcomes. Consult your tax advisor regarding the solar tax credit and how it applies to your specific circumstances. Please visit the dsireusa.org website for detailed solar policy information. 2 SunPower panel efficiency: Based on search of datasheet values from websites of top 20 manufacturers per IHS, as of January 2018. 3 SunPower panel durability: "Fraunhofer PV Durability Initiative for Solar Modules: Part 3". PVTech Power, 2015. 4 SunPower 360W compared to a Conventional Panel on same sized arrays (260W, 16% efficient, approx. 1.6 m2), 4% more energy per watt (based on 3pty module characterization and PVSim), 0.75%/yr slower degradation (Campeau, Z. et al. "SunPower Module Degradation Rate," SunPower white paper, 2013).